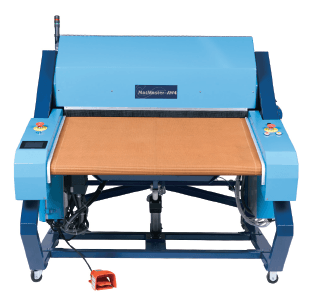 Get more from your walk-off mat business with this great new machine from industry leader MPT. Instead of returning to the operator, rolled mats automatically move to the next operation, increasing productivity and reducing labor. * Air use based on unpressurized cylinder volume at 200 operations per hour. Roll safer, smoother and smarter with these cost-effective innovations. Loads carpet-side up for visual inspection. Final hands-on quality control ensures customer satisfaction. 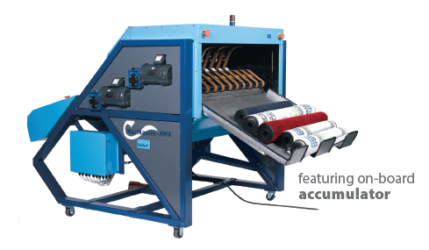 Rolls carpet-side out for easiest sorting and storage. This machine also loads rubber-side up and returns rubber-side out if required. 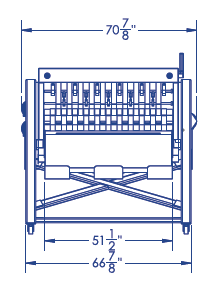 Rolls tighter Center diameter of 1”–2” provides sturdy core, preventing mat collapse and safety problems caused by deformation. 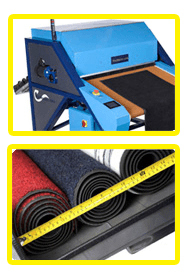 Mats finish neater and more compact, resulting in space-saving benefits during delivery and storage. Rolls faster Higher capacity means higher production. Increases delivery options Choose accumulator, bin container or conveyor. Doubles productivity Instead of requiring the operator to pick up, carry and walk with the mat, he’s already placing the next one on the bed. 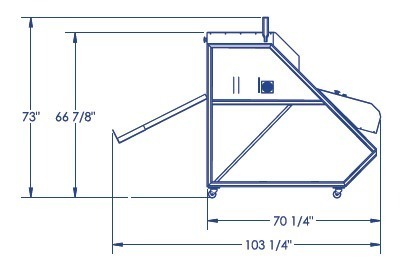 Increases safety Less lifting-turning-walkingbending means fewer repetitive-stress difficulties. Built-in photo-electric sensor for instant shutoff protects workers. 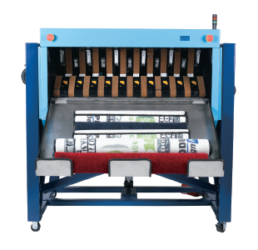 MPT’s single belt roller bed eliminates pinch-point issues. Reduces risk to your staff and your income. Avoid downtime, insurance issues, compliance concerns and injuries. Fits your needs Two sizes available. 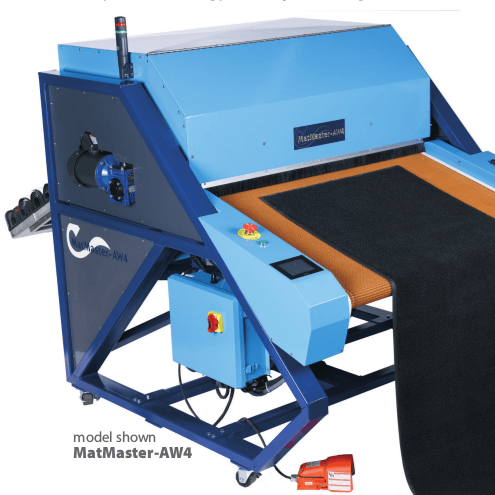 Choose a machine that handles mats up to 4-ft wide or up to 6-ft wide. 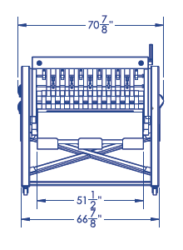 Fits your staff Ergonomic height-adjustable mat loading bed and accumulator. Matches your workflow Select between manual and automatic operation. Factory test results show 300 to 500 mats/hour depending on mat size and area set-up!